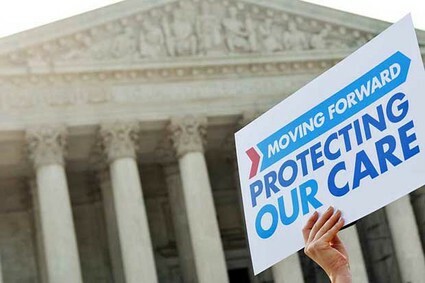 The Supreme Court’s decision will not bring the debate on healthcare to a close in the short term, prior to November. But it may do so in the middle and long term, sooner than most think. And, more importantly, it may see the kind of real change in American society that Obama campaigned on in 2008. It allows us to move forward, not backwards. It allows real benefits for families to be implemented that would have been hard to imagine if the Supreme Court had thrown out the law. The facts are clear: Seventeen million children with pre-existing conditions can no longer be denied coverage, 6.6 million young adults have the security of coverage until they are 26, 86 million Americans have benefited from free preventive services like mammograms or wellness visits for seniors, and tens of millions of Americans will be covered now who were not before. This is doing for everyday Americans what Medicare did for seniors in the 1960s, and every day since. That program failed in Congress twice before it was passed in 1965. Polls showed real concern back in the late 1950s and early ’60s that we were entering into an era of “socialized medicine.” Doctors opposed it and Ronald Reagan was their key spokesperson. Both came around to a deep appreciation of how it transformed the lives of seniors, over a third of whom lived in poverty and were one illness away from financial ruin. This may do for Barack Obama what the Cuban Missile Crisis did for President Kennedy—a real win that demonstrated leadership at its best. It took courage, perseverance, and patience, when many urged just the opposite. It took vision and the ability to work through a complex series of choices and possible outcomes to pull people together when a lot hung in the balance. Republicans believed that this would be Obama’s Waterloo, and 50 years ago they believed Kennedy could not stand up to Khrushchev. But at the end of the day this may prove to be not Waterloo, but D-Day, not capitulation but strength. It took a long time to pass healthcare legislation since Harry Truman first introduced it, but we are on the right road now and the Supreme Court ruling makes all the difference. It was a transformative decision.